Somebody pinch me, I can't comprehend that 2014 is over. Seriously I need someone to sit me down and explain where the heck it went. 2014 was a great year for me, probably one of the bests I've had. I have a whole post dedicated to the best moments of it which you can read here. Anyways it's now January 2015.... so weird for me to even type out let alone think about... like 2030 is as far away as 2000...... LET THAT SINK IN. I CAN'T EVEN. Okay Sam back on track. 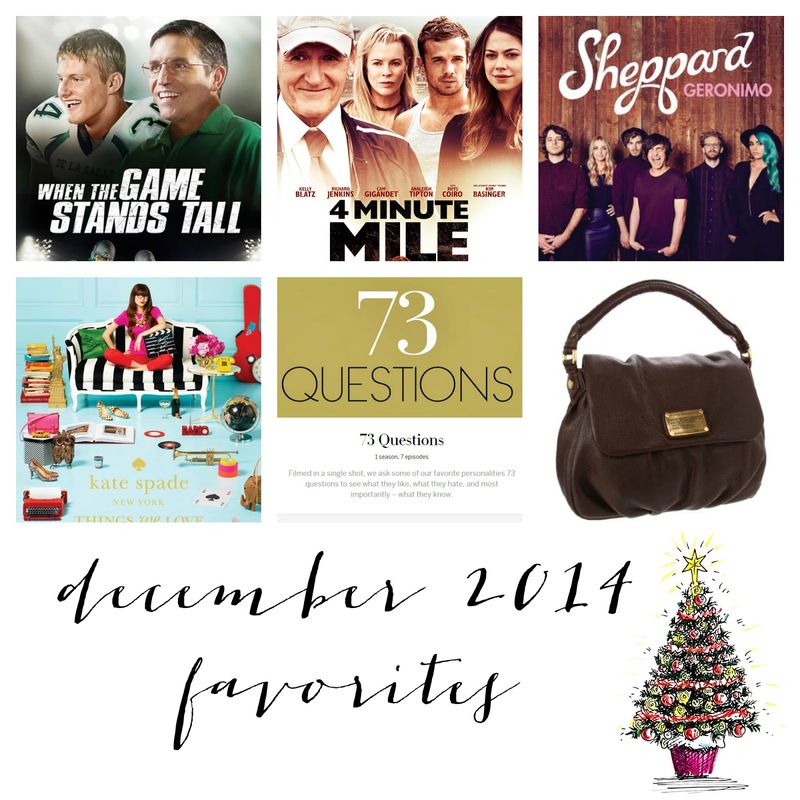 It's January which means December favorites! So let's get to it! No. 2: 4 Minute Mile// Keeping with the sports movie trend I watched the 4 Minute Mile on Netflix. It was a 'suggested movie' and I read the bio and it looked pretty good. I never heard talk about it so I thought it was a C-List movie and didn't have too high of hopes. I was pleasantly surprised at the story line, acting and overall quality of the movie. It tells the story of Drew, natural runner with a lot of talent but has a lot of anger and angst built up. A former track coach takes him under his wing and trains him. Tragedy strikes and forces him to confront everything that has been holding him back. This is such a good movie and honestly is one of my top sports movies. I definitely recommend watching it. You won't be disappointed! No. 3: Sheppard// I found this band while listening to the radio and was instantly hooked. They're an Australian indie band and they're a new favorite of mine now. They have an album out but it's not on Spotify :( But their EP is. Geronimo and Something's Missing are my two favorites. You can check out their sound here on Spotify! No. 5: 73 Questions With . . .// I found out about these via MeghanRosette's Vlogmas videos. I decided to check it out and ended up obsessed and wanting more. So far there is only 1 season and the interviewees are Blake Likely, Amy Adams, Reese Witherspoon, Daniel Radcliffe, Anna Wintour, Olivia Munn and Sarah Jessica Parker. You can watch all of them here! Blake and Reese's are my favorite. When do I wake up and look like either of them? They're absolute perfection! No. 6: Marc Jacobs Lil Ukita// I saw this bag originally at Nordstrom Rack in a bright hot pink color. I absolutely loved everything about the bag but couldn't fork over the moolah for it. So I went to Google to search for one. After visiting about a million websites I finally ended up on eBay where I found one for $150. After a very tense bidding session it was finally mine! I DIED. I didn't get it in the hot pink but this gorgeous deep chocolate brown color. This is my second favorite bag I've ever gotten. I'm so in love with it. It's perfect in every way possible. I will definitely be carrying it for pretty much ever. No. 7: Christmas// Christmas was obviously this month and a definite highlight/favorite of mine! I love Christmastime, it's my favorite holiday and I am in the serious post Christmas depression. I had an amazing Christmas. It was spent with family playing games, watching movies, eating delicious food and hanging out. I have an entire post about it which you can check out here! Well all that's all for my December favorites! Short I know! I think it was a pretty balanced month of favorites. A little sleeping and Netflix, a little being out in the real world. It was a good month!